Quite a busy week, I think! I started off my week with an 8.45am session with Rama on Sunday morning. I was keen to get back on track after the week before where I did almost nothing. Dad and I went to Texas Roadhouse for lunch at the Dubai Mall – I wasn’t all that keen on going, but thought it would be a change from PF Chang! I ordered a filet steak, with a salad and jacket potato on the side. The house salad was disappointing but the steak was actually very good. I was pleasantly surprised – and very full when I was done. We walked around for a while and sat down for coffee at Gloria Jean’s on the first floor. Just that morning I’d complained to Rama that most places in Dubai had never heard of a flat white coffee – even the staff at Starbucks stared at me blankly when I asked for it. At Gloria Jean’s it was on the menu – and it was one of the best coffees I’ve had in Dubai. Definitely somewhere to go back to! Dad had a doctor’s appointment after that, so while he was at the clinic I went to the supermarket next door and picked up whatever we needed for the house. Joy had given me a list of things we’d run out of so I trawled the aisles looking for them. It was so dull. I took my time on purpose as I knew Dad’s doctor was running late, but it was just so boring. I’m sure the security guards looked at me suspiciously as I pottered down the aisles over and over again. Anyway, we finally got home, I changed into my pajamas and that was Sunday over with. On Monday I had my yoga class at home and then worked all day. On Tuesday I met a friend for lunch at Social House at the Dubai Mall. The last time I went there we sat inside on bench-type chairs which weren’t conducive to long lunches. I didn’t realise there was a whole separate section on the other side – and a huge outdoor section. It was a nice lunch – I had the spicy tuna roll to start with and then had the spicy wok-fried chicken. The portion was really big and I ended up taking half of it home for Joy. On Wednesday I had my 10th session with Rama and then worked the rest of the day. My yoga teacher had a cancellation on Thursday so my cousin and I took advantage of that! I then went to PF Chang for lunch at the mall (again). Someone I know had just gotten married and moved to Dubai – she got in touch and we decided to meet for lunch. There were four of us in the end – the two of us, her friend from Singapore who also lives here (who I met for lunch a few weeks before at Social House), and her cousin who lives in Dubai. They decided to wander around the mall after lunch, but I headed home. On Thursday night I was supposed to go to one of the British expat meet-ups in Marina, but that afternoon a friend said he was going to Okku for dinner and did I want to join him? I still drool when I think of the truffle fried rice, so I said I would. I met him there at 8pm – we had a table at the bar. He had said two other people were joining us but they were running late. In the meantime we ordered a portion of the wasabi rock shrimp and two types of chicken. I’d forgotten he rarely eats anything but chicken. Oh well, more shrimp for me, and I thought we could order some more food when the others arrived. When they did arrive, one turned out to be vegetarian and the other vegan. Yes, vegan! This did not bode well for the food fest I had planned. So I switched to vodka. After dinner we moved to the bar and a couple of other friends joined us. It wasn’t a late night but it was nice to be out and about! On Friday, I woke up and looked out the window. I couldn’t see very far and thought it was fog… but it was a sandstorm. A couple of hours later, it got worse. 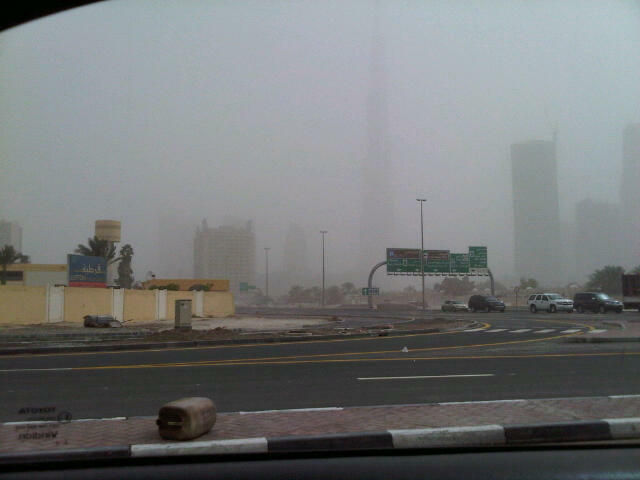 When I leave my building, the first thing I see is the Burj Khalifa, but on Friday it had disappeared. Apparently visibility was 800m that day (according to the paper). When I think of sandstorms I think of that old Laurel and Hardy movie, Beau Hunks, where they join the Foreign Legion because Hardy has a broken heart – and they then get lost in the desert in a sandstorm! We were only outside for 10 minutes at the most but by the time I got home, there was sand in my hair, my eyes, my throat… it was gross. That night I had dinner with my cousins at Spectrum on One at the Fairmont. The restaurant was empty – apparently it gets very busy for Friday brunch, but by dinner time the crowd had gone. We had sushi to start with, and then shared the prawn teppanyaki and two portions of the lamb chops. We had ordered the black pepper beef but sent it back as it wasn’t very good. We shared the chocolate fondant for dessert. Another cousin from Lagos arrived on Saturday morning – and was staying with us. He arrived at about 9.30am and we chatted for a couple of hours until he decided to go nap. I went to the gym. 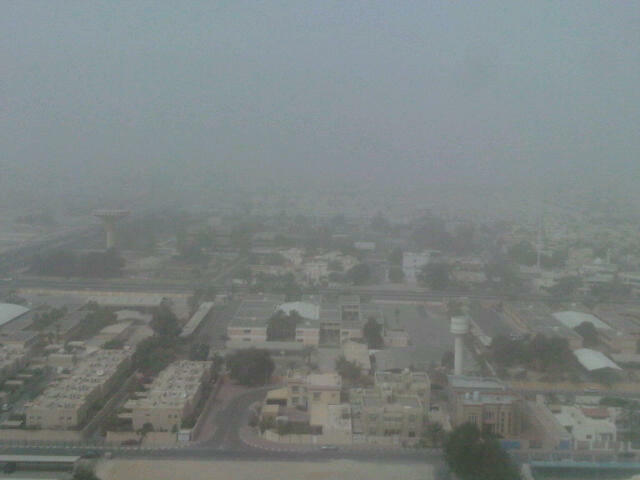 The sandstorm still hadn’t subsided. We later met our other cousins for lunch at Lafayette Gourmet – the service was bad, and I wasn’t sure whether our waiter was a man or a woman. I asked the others what they thought and they weren’t sure either. We had a mixture of food for lunch – sushi, pasta, curry – they do it all there. After that we went to Caffe Nero for coffee. I did try to get them to go to Gloria Jean’s but they said it was too far.